in Creative & Tech with tags #NationalHotDogDay, Hot Dogs, oscar mayer, Wiener Rover, Wienermobile Both comments and trackbacks are closed. For decades, the Wienermobile has been the heart and soul of the Oscar Mayer brand, bringing smiles to people all across the country – but not hot dogs. Today, on National Hot Dog day, that all changes as 360i partners with client Oscar Mayer to unveil the newest addition to the Wienermobile fleet – the Wiener Rover. Its mission is simple: to boldly go where no Wienermobile has gone before to deliver hot dogs. About one-seventh the size of the original Wienermobile, the Wiener Rover is a smaller, remote-controlled hot dog on heavy-duty wheels that can go off-roading over grass, dirt, sand, or rocks to deliver its precious cargo of warm, ready-to-eat hot dogs. After making it’s first appearance on the Today Show, the Wiener Rover will continue roving around various parts of New York City to surprise and delight hungry hot-dog fans. New Yorkers can tweet or Instagram their location using #WienerRover for the chance to receive a hot dog; and hot dog lovers across the country can follow @OscarMayer on Twitter and Instagram to find out where the Wiener Rover is headed next. 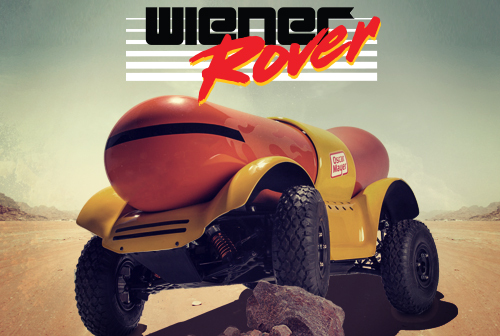 For more information on the Wiener Rover and the rest of the Wienermobile fleet, visit www.OscarMayer.com.